Some weeks ago, I set a goal for Patreon subscriptions. Since that time, there have been calls and boycotts of the service in regards to de-platforming and free speech. I thought the best thing to do would be to delay judgement until I could collect more information. While I do not agree with the speech of the person who prompted this scandal (? ), it does seems strange that Patreon would ban someone for actions taken elsewhere. However, as a private entity, it seems to me that have the right to do just that, even though the rules governing this seem to me to be poorly written. I believe that my choice to suspend judgment is the correct one for the time, and would solicit readers’ opinions on this issue of free speech, de-platforming, and the like. If you’re not totally familiar with the issue, several high profile folks on Patreon have very publically left the platform after one person in particular said something distasteful on another platform. This became a free speech issue in the minds of some, and thus the shakeup. Thoughts? 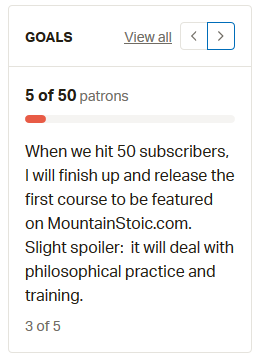 Should MountainStoic continue to use such a platform, are the claims with or without merit? Let me know where the readers are at either by commenting below, or by private message if you’d prefer. In the mean time, I’m working on those goals. ← Stoicism, The School of Life, and suicide.